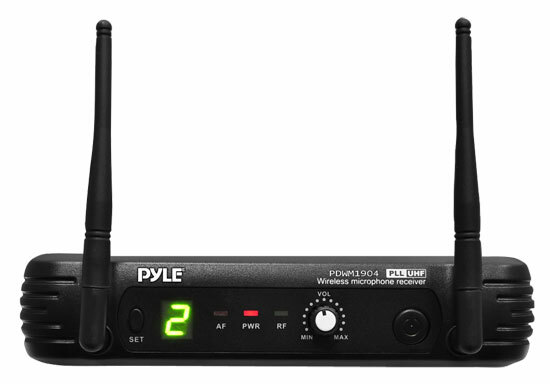 The Pyle PREMIER Series Wireless Microphone System will provide you with the performance you've been looking for. 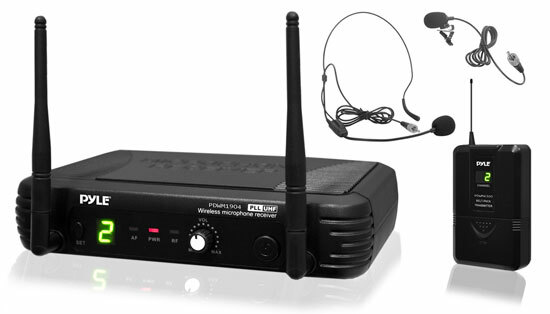 System comes with wireless body-pack transmitter, headset & lavalier microphone. Whether used for work or play, this microphone system is easy to setup, easy to use, and best of all, will give you an amazing high-quality audio experience. Choose from 8 different channels to transmit over. Enjoy hassle-free and reliable wireless sound transmission with today's latest system technology with this all-in-one package. Excellent sound production for vocals or speech and perfect for just about any event on stage, in the office or even at home. Comes with everything you need to perform. No matter what you use it for, the Pyle PREMIER Series Wireless Microphone System will take your sound and style to the next level. Please ensure that the user holds the relevent licenses for operating VHF equipment in accordance with local law. Please ensure that the user holds the relevent licenses for operating VHF equipment in accordance with local law. LED Power Indicator & Channel Display|Operation Range: Up to 164 ft.|UHF signal system for wider range and less obstruction|Audio Level Indicator for wireless system audio signal level|RF Signal Indicator for transmitter signal strength|SET function for channel selection|Adjustable volume control|1-4'' audio output jack|XLR balanced output jack|AC-DC adapter power jack|Power Supply: 110-220V|Receiver Specifications|RF Frequency Range: 673-697.975 MHz|Image & Spurious Rejection: >70 dB|Receiving Sensitivity: -105 dB|Signal - Noise Ratio: -105dB|Border Upon Channel Rejection: > 70 dB|T.H.D. : < 1%|Audio Output Level: 0-300 mV|Power Requirements: 13-15V DC nominal 300 mA|Dimensions 6.8 x 5.3 x 1.7 in|Body-Pack Transmitter Specifications|Includes wireless body-pack transmitter, headset & lavalier microphones|RF Frequency Range: 673-697.975 MHz|RF Output: >10 dBm|Modulation Type: FM|Max Deviation: ± 40 KHz|Spurious Emission: > 55 dBc|Nominal Current Drain: < 40mA|Power Requirements: 2 x 1.5V AA|Sold as : 0|Weight :2.5 lbs.